Elev. Prec. lets you adjust the elevator pre-compensation which prevents ballooning/booming up especially in fast forward flight (banked). To check, do a vertical climb out. If the nose tends to go upward, increase. Padelsim. Flybarred helis have a very specific feel. Set values in the range of 20-40 to make VBar simulate this to a certain degree. Set to 0 to turn this feature off (banked). Heli size is a factor to the control loop to adapt it to the actual size of your heli. See table for relation between heli size and parameter value. The parameter does not only take into account the size (e.g. blade length) but also the weight/disc load/inertia and the dampening. This parameter is set during the initial setup using the wizard and does usually not need to be changed. Integral is the heading hold gain of the main rotor control loops (banked). Pitch Pump adds a dynammic add to fast collective inputs. The output to the servo will be temporarily increased if the stick is moved fast, like in tic tocs. Slow movements of the collective stick are not affected, which allows for smooth cruising and hovering at the same time. Values in the range of 30-60 are recommended. Set to 0 to turn this feature off (banked). Attention You can use this feature to check the reliability of your power supply to the r/c system and the servos. Set to 50 temporarily and move the collective stick quickly: in case the r/c system resets under this strain, the power supply must be considered too weak, or the servos cause back voltages. You will also see low voltage warnings in the event log, then. Warning Set this parameter back to a sensible value prior to flying your heli again. In flight, this extreme dynamic increase of collective output will most probably lead to a loss of control and crash. Cyclic Ring limits the combined output of aileron and elevator if the control inputs are both together exceeding 100 %. You can use it to adjust the maximum throws of your swash plate to avoid binding and damage to the mechanics and the servos. The default value is 85. To check, move the collective stick to 50 % and at the same time input full aileron and elevator throw. In case of binding, lower the value until the mechanics no longer bind. Values below 75 will start to limit the clean aileron and elevator outputs, too. In this case, check if you can modify the geometry of the rotor head and linkages. Optimizer is used to adjust the requested and actual turning rates for aileron and elevator. Do aileron and then elevator flips in one spot to have the optimizer work fast. Just fly your regular patterns to have the optimizer work too, but more slowly. Disable the optimizer once you are content with the feel of the heli, to prevent the optimizer from altering flight characteristics depending on your current style of flying. You may enter values manually, e.g. if you have experience with a certain type of heli and blades (banked). The collective curve allows to set a curve for each bank separately, the same way as on regular radios. This way, you can have different collective angles e.g. for hovering/cruising or for scale helis, or symmetric curves for 3-D-flight. 'Reset' sets the values of the bank currently active back to defaults. Allows to change the swash plate conficuration independently from the setup wizard. Allows to set the direction of rotation independently from the seup wizard, always with regard to the actual situation on the model. Allows to change between leadin edge and trailing edge control of the main rotor blades independently from the setup wizard. 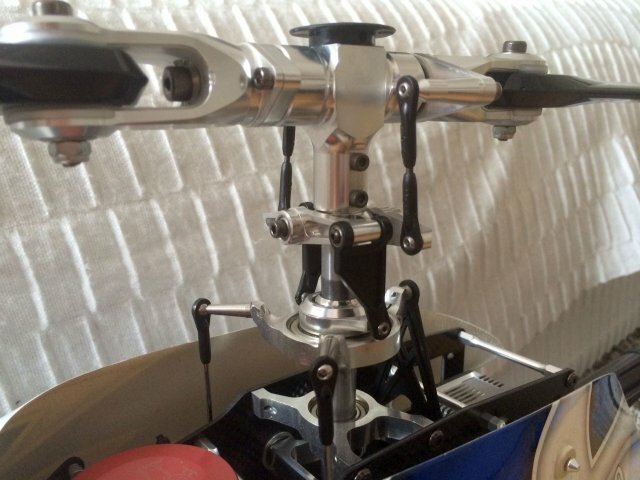 If you have a heli with levers in between the rods from the swash plate to the blade grips, which reverse the direction of movement of the rods (seen e.g. on some TT helis), please set this parameter opposing to the display here, else some of the feed forwards (like tail rotor pre-compensation) might work the wrong way. Allows to reverse individual servos independently from the setup wizard. Allows trims to the swash plate independently from the setup wizard. Note that the bar graphs should show little deviation. If you have to trim more than a third into either direction, please re-set the servo arm and trim closer to the zero position. Allows setting individual end points for positive and negative collective independently from the setup wizard. Values between 80-110 for 12-14° indicate that the geometry of the rotor head is well suitable for a flybarless system. Allows to calibrate the control loop of your VBar independently from the setup wizard. Values between 80-100 indicate that the geometry of the rotor head is well suitable for a flybarless system.